The best family moments are always enjoyed over a satisfying meal. With plenty of dining options to choose from, selecting the right family-friendly restaurant can be daunting. Are the tables wide enough for the entire family? Will the kids like the food? Does the menu have plenty of dishes for everyone to share? Phew! There are just so many things to consider. 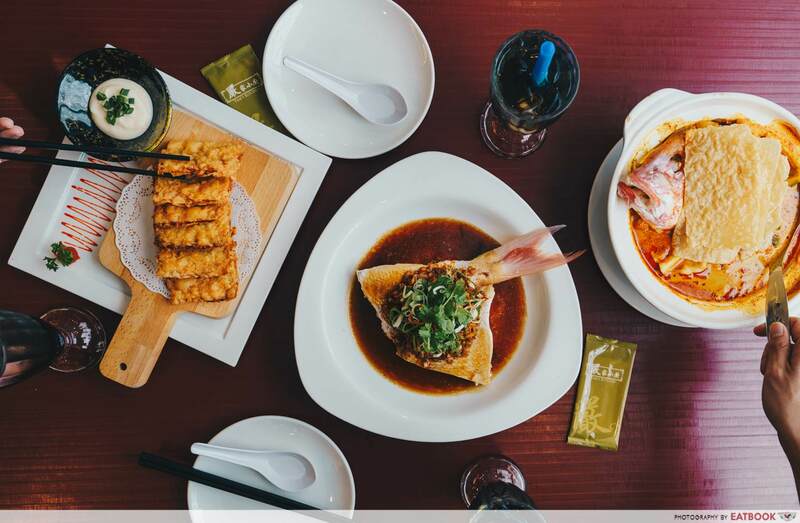 We’ve compiled a list of restaurants, located at Market Square @ Downtown East, that are great for families to gather around and spend some quality time together. The vibrancy of a hotpot experience is second to none. Everyone participates in the cooking, enjoys the abundance of food, and most importantly takes part in lively conversations throughout the meal. 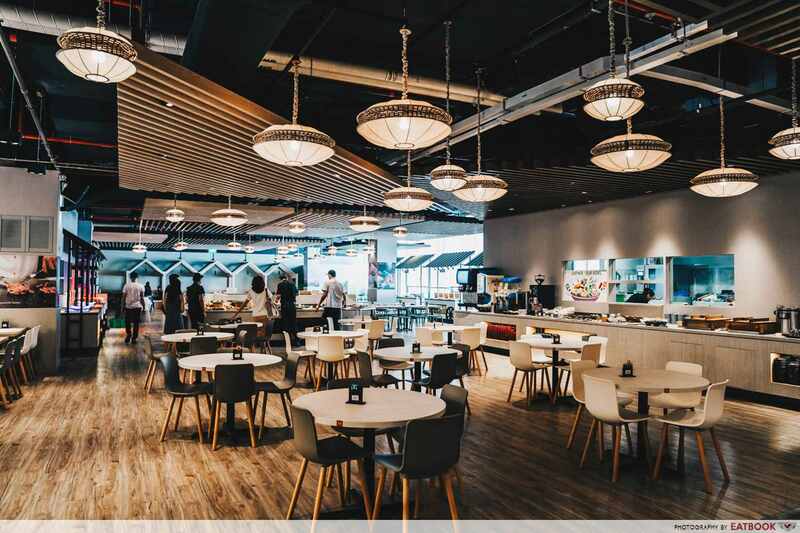 The sister brand of popular Western restaurant chain Astons, MANLE Hotpot’s dinner buffet provides great value for the entire family with adults paying $28.80+ and children paying $18.80+ for all days of the week. 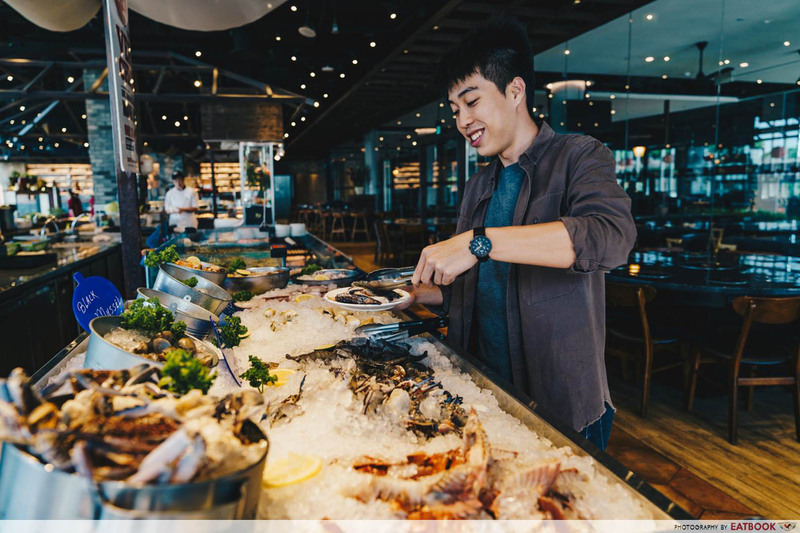 With over 100 types of fresh seafood, sliced meat, vegetables, and 24 different types of condiments, there’s something for everyone in the family. My favourite out of the lot was definitely batang fish, the richly flavoured fish with a firm texture commonly found in sliced fish soup and porridge. 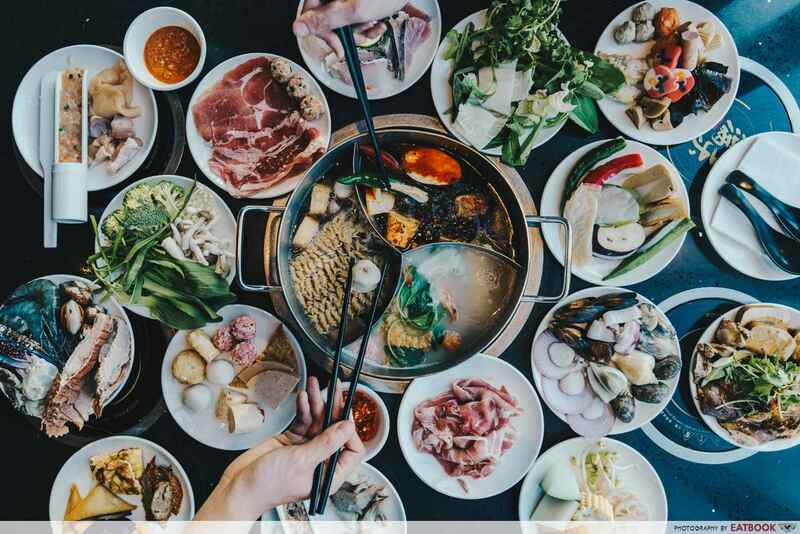 Unlike other hotpot buffets that commonly serve flavourless dory fish, MANLE serves up an unlimited supply of batang fish, turning the fantasies of every sliced fish soup lover into reality. Step inside this bustling Chinese restaurant and you’ll immediately feel at home with its lively and homely atmosphere. Yam’s Kitchen is helmed by Chef Kelvin Yam, who is known for fish tail dishes. The restaurant is well equipped for family occasions, with plenty of large tables and lazy Susans for communal dining and even baby high chairs so that the little ones are not missing out on all the fun. The sweet smell of the Steam Fish Tail topped with Cai Poh ($24.80+) struck us just before it arrived at the table. 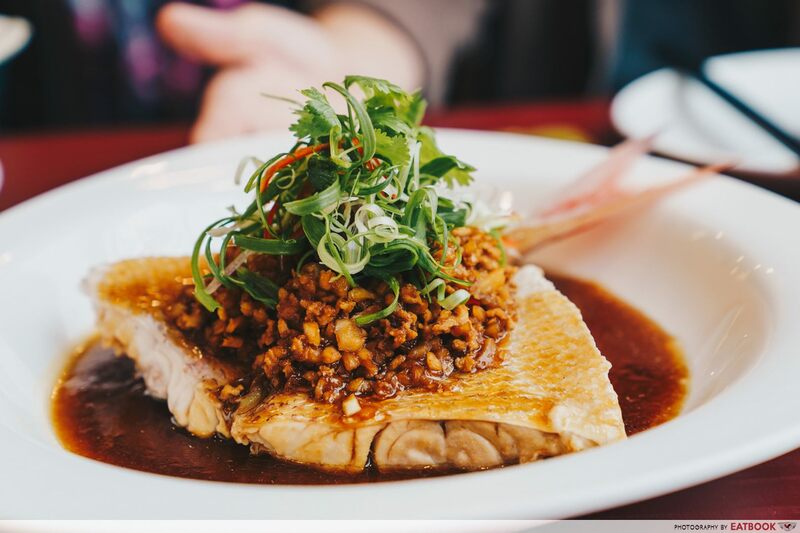 Using red snapper fish tail, the fish is steamed in a blend of ginger and soy sauce, with generous servings of sweet and crunchy cai poh heaped onto it. Kids and lazy eaters will particularly love this dish, thanks to the absence of fish bones. Both the Steam Fish Tail topped with Cai Poh and Hakka Prawn Cake with Chives are new additions to the menu and will only be available from October. However, the restaurant is able to accommodate any request for these new items, just ask! It’s all about comforting flavours when it comes to home-cooked food. 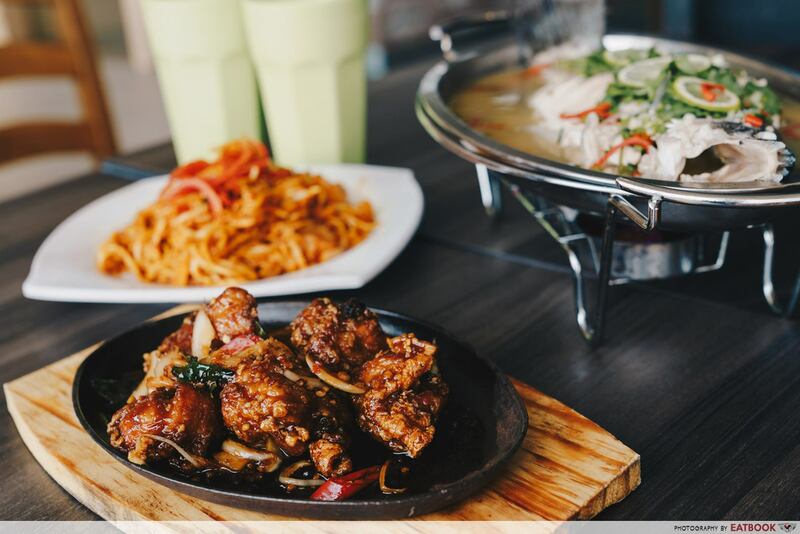 The halal-certified Segar Restaurant replicates that familiar taste with Thai-Chinese cuisine that makes you feel right at home, along with pocket-friendly prices. 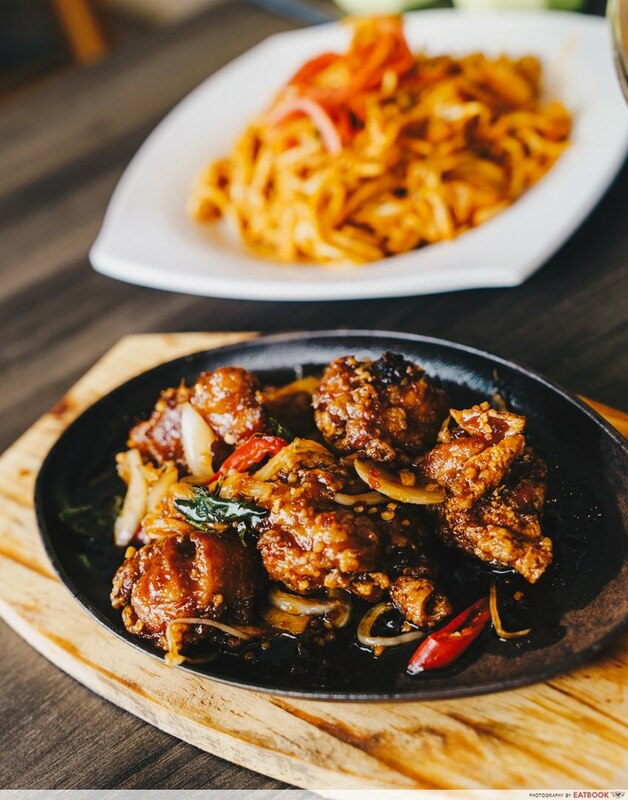 The Hotplate Golden Chicken ($12) comes bubbling in a thick coat of housemade, Thai-inspired sweet sauce that makes it great to share around. Kids who are afraid of spicy food don’t need to fear, the sauce does not have much spiciness to it, providing instead a slightly sour tang that tastes a little like Korean fried chicken. The chicken remains nicely crisp, despite the thick lashings of sauce, due to them being cooked twice – first deep-fried with flour, then a second time in the wok and sauce to soak up all the sweet goodness. The brainchild of Chef Steven Low, former sous chef of the famous Chatterbox at Meritus Mandarin hotel, Mr Chicken Rice serves up hotel-quality chicken rice – at just a fraction of its price. 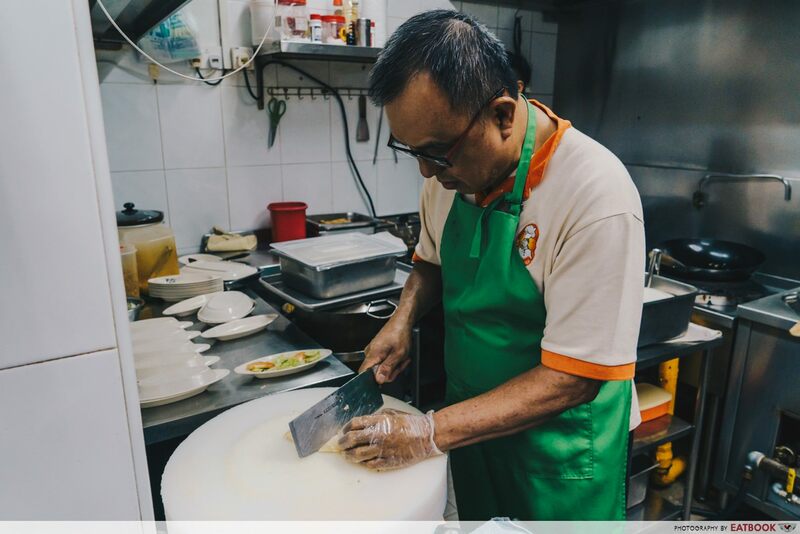 After 32 years of serving up the famous chicken rice at Chatterbox, Chef Steven was handed the “pink slip” and told to leave the company. He decided to open up this simple no-frills store to make the chicken rice that everyone loves more accessible. The same techniques and ingredients used at Chatterbox are used here, with Chef Steven also insisting on fresh Malaysian chickens that are delivered to the store daily. 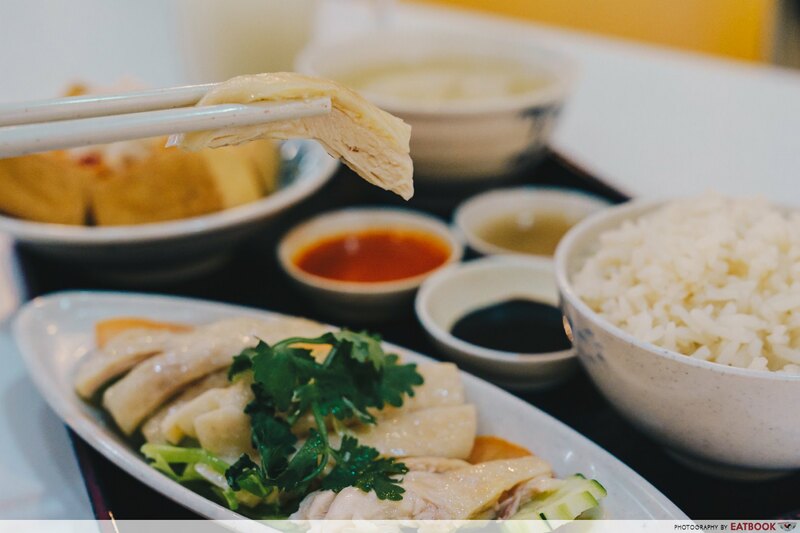 The most popular item at Mr Chicken Rice is chicken rice, but give their Signature Tofu Set ($7.50) a try and you’ll be bowled over by how simple yet delicious it tastes. The tofu is light and crispy on the outside, bite into it and you’ll find soft and creamy goodness on the inside. A thick drizzle of garlic chilli sauce is added to give an additional sharp kick to the dish. I like how the chilli was not overpoweringly spicy, but had a garlicky taste that went well with the smooth tofu. I’ve visited this store a number of times and each time, the consistency of the chicken remains quite high. It has a juicy and firm bite to it, and the rice is not too oily but could be a little more fragrant. 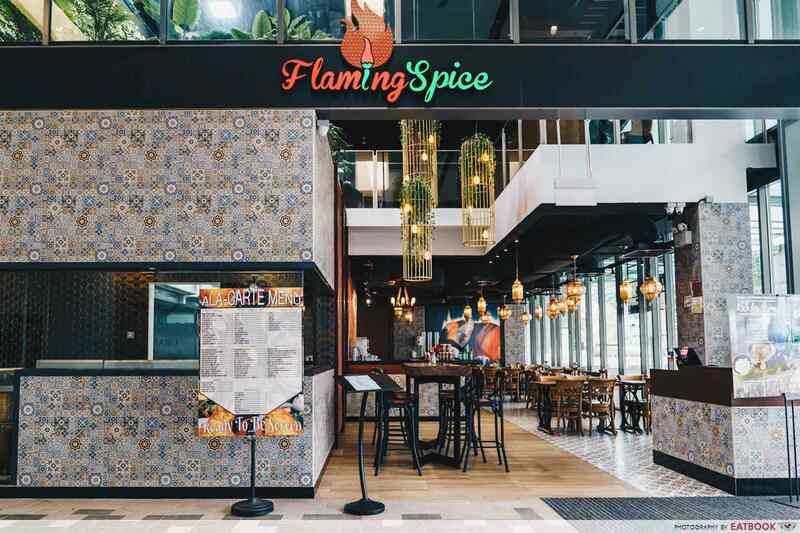 Newly opened in June 2018, Flaming Spice’s location in front of the busy Pasir Ris Drive 3 Close makes it an ideal place to chill out with the family on a lazy Sunday. Feel the natural breeze at the outdoor alfresco area or go for the indoor seating, which includes a cosy mezzanine, complete with lounge sofas. The entire store is tastefully decorated, with warm ambient lighting and Persian-inspired decor to bring on the #chillvibes. The Chicken Briyani ($10.50++) comes served in a huge mountain of fragrant basmati rice, and is accompanied by a refreshing serving of yogurt sauce. We found the chicken to be a little firm, but the accompanying sauce packed with plenty of aromatic spices. It’s a good idea to share just a plate of it and order other dishes such as their Fish Head Curry ($16++) as the servings are generous. 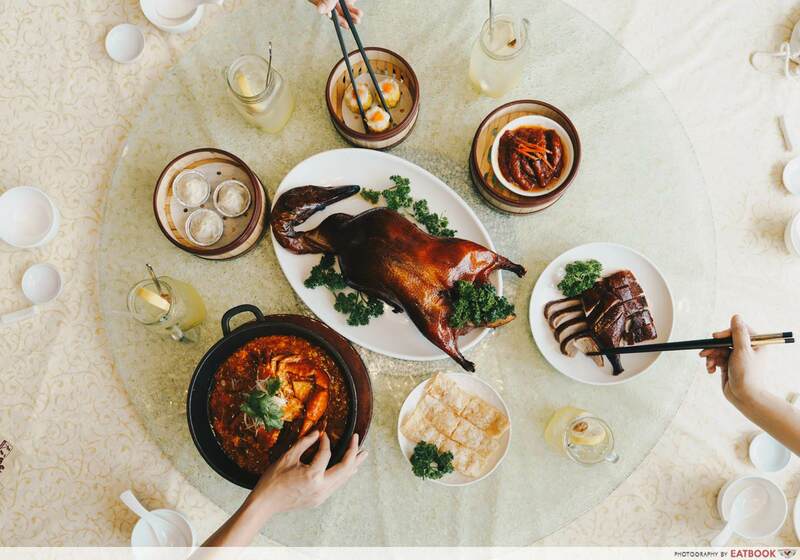 With over 40 years of experience in hotels and restaurants around Singapore and Hong Kong, executive chef Jacky Liu helms the kitchen of this Hong Kong-style restaurant that is famous for their “Heavenly Duck”. The restaurant contains plenty of large tables and even has two comfortable VIP rooms where private events and gatherings can be held. 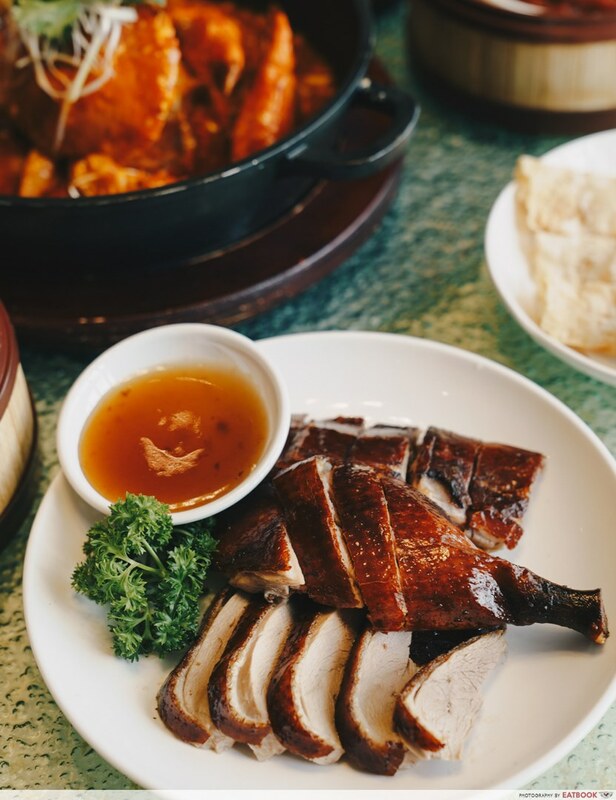 Using traditional roasting methods, their Crispy Roasted Duck ($28++ for half, $52++ for whole) comes with a crispy skin that goes very well with the tender and juicy duck meat. You can also get freshly handmade dim sum, the only one at Downtown East, with the Deep Fried Beancurd Roll ($5.20++) emerging as my personal favourite thanks to the beancurd skin which was fried to crisp perfection. It’s not every day that you get to find a Hong Kong restaurant selling chilli crab. The sister restaurant of Crab Corner in Joo Koon, Heavenly Duck also offers a wide variety of crab dishes with their Signature Chilli Crab (seasonal price) using the exact same recipe and technique as the outlet in Joo Koon. The succulent flesh of the crab went well with the tangy chilli crab gravy, which was not too spicy. Opened in 2004, Sakura International Buffet has a long history in Downtown East. I remember climbing up the stairs, instead of the escalators, so that I could lay my hands on their teppanyaki dishes quicker. Still on the second floor, Sakura continues to serve up a wide variety of international cuisines. 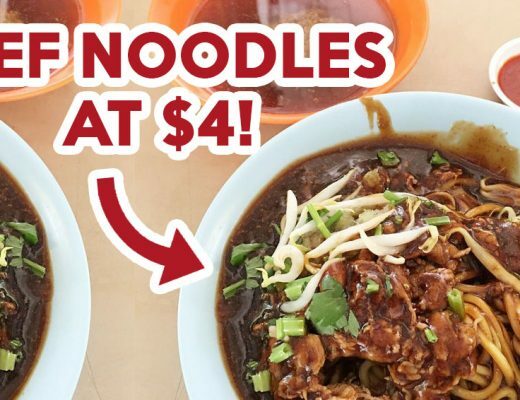 Prices start from $24.80++ for adults and $12.80++ for children during lunch, and $38.80++ for adults and $15.80++ for children during dinner. 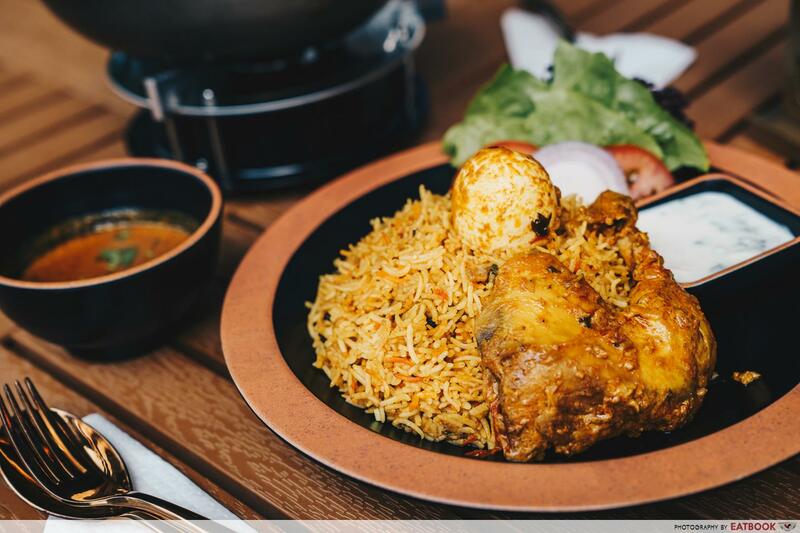 The entire family is in for a treat with a wide range of dishes at this halal-certified restaurant. 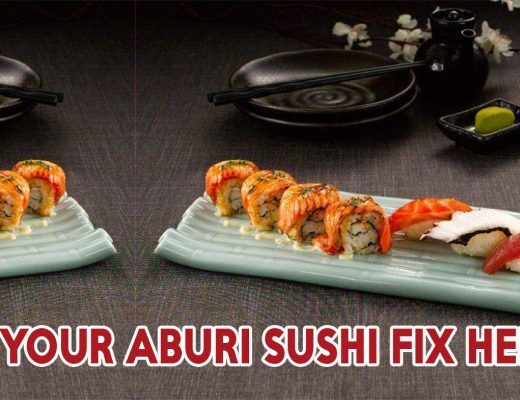 This includes dim sum, sushi, sashimi, and their signature teppanyaki station which features meats that are fried upon order. 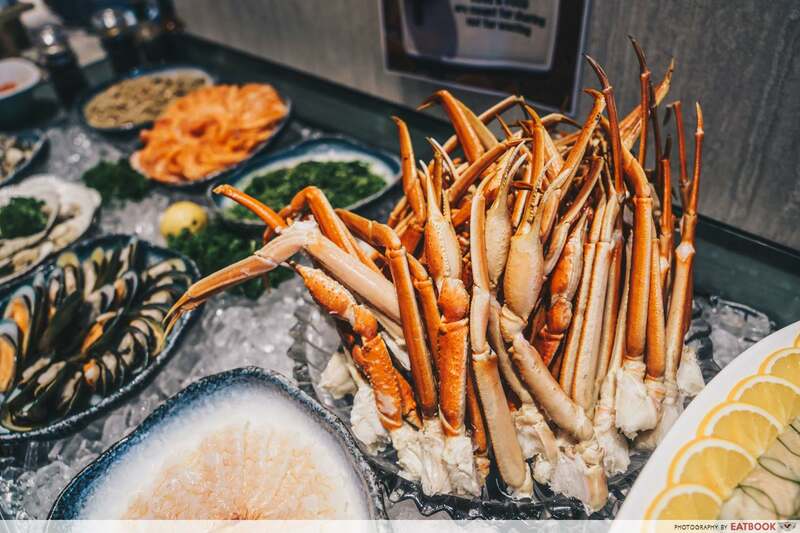 For dinner, there’s also an additional treat of snow crab and poached salmon to choose from, with the fresh snow crab proving to be extremely popular. Children and those with a sweet tooth will probably be excited for their Häagen-Dazs ice-cream, which comes in vanilla and Belgian chocolate flavours. You can also create your own sundaes with an assortment of toppings and sauces. Just make sure the kids don’t mix them all up and force you to eat them instead. 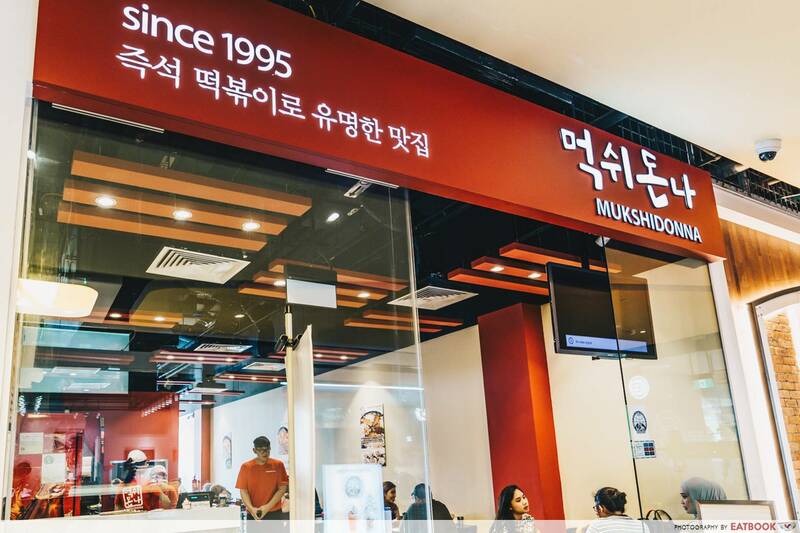 Finding good Korean food is hard in Singapore, especially halal-certified ones. Mukshidonna is often packed in the evenings, thanks to its hearty Korean stews that make it perfect for the entire family to gather around and unwind during a cold day. Ordering the stews might seem intimidating at first. 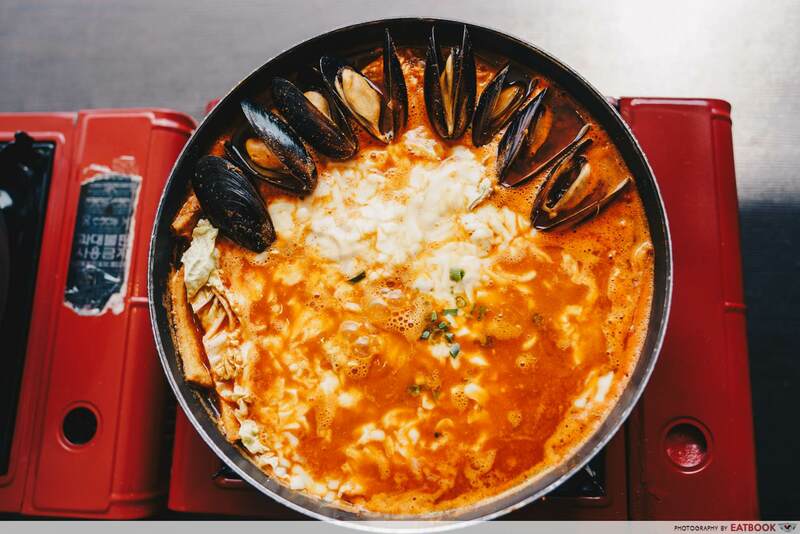 You place your order on a form and choose from Cheese ($13.90), Mussels ($13.90), Beef Bulgogi ($13.90), Budae Chicken Sausage ($13.90) and Mushroom ($13.90). You’ll need to order a minimum of two stews for a party of four and it’s highly recommended to mix them up together for greater variety. The mussels and cheese make a great combination, with the plump and meaty mussels going well with the creamy mozzarella cheese. The sauce also has the right amount of sourness to it, while the tteokbokki was surprisingly soft and chewy. 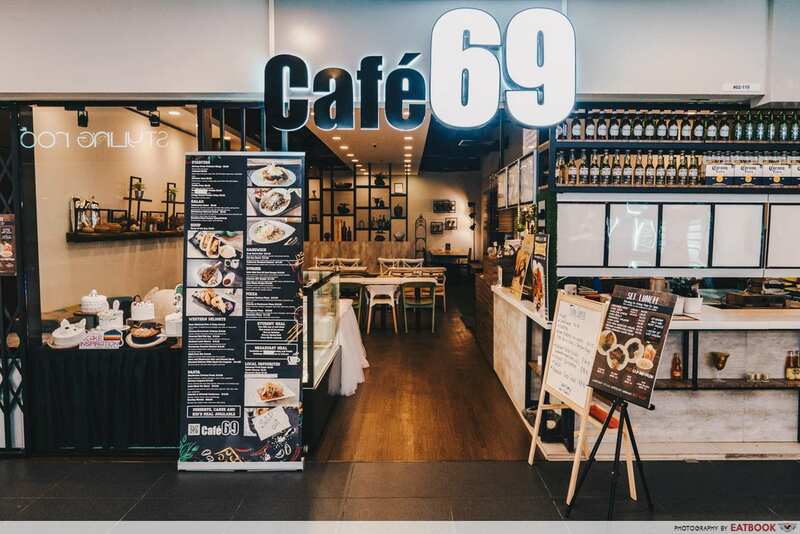 Cheerfully decorated with plenty of comfortable seats and large tables for the entire family to relax and chill the afternoon away, Café 69 comes stocked with child-friendly amenities such as plastic cutlery, cups and baby chairs for the young ones. The extensive menu consists of both local and Western favourites with a wide variety of cakes and kid’s meals for the entire family. 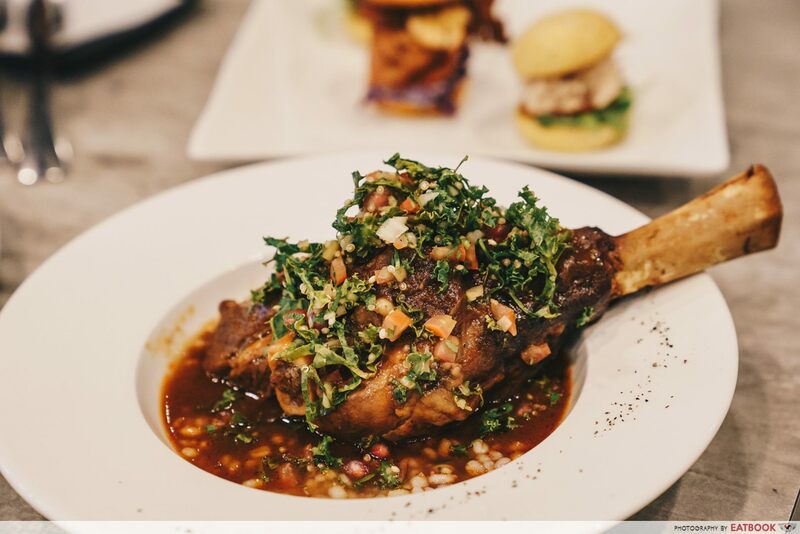 The Lamb Shank ($19.90+) comes on the bone, with a generous serving of honey barley risotto and tabbouleh salad. The fork-tender lamb fell off the bone after a few nudges of the fork and was cooked just right with the meat packed full of flavour. The honey barley risotto was also a pleasant surprise, giving a subtle sweetness to the thick and rich lamb gravy. There’s something for every member of the family at Ice Edge Café. Dads can stay rooted to their seats with the live screening of the English Premier League (EPL) matches during the weekends, while the kids will fall in love with the wide range of housemade gelato that comes with Ice Edge’s signature waffle ($12.80++ for a single scoop, $17.30++ for double). 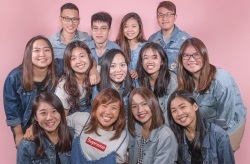 There’s a wide range of flavours, from classics such as vanilla and pistachio to more interesting variants such as cotton candy and Champagne vanilla. 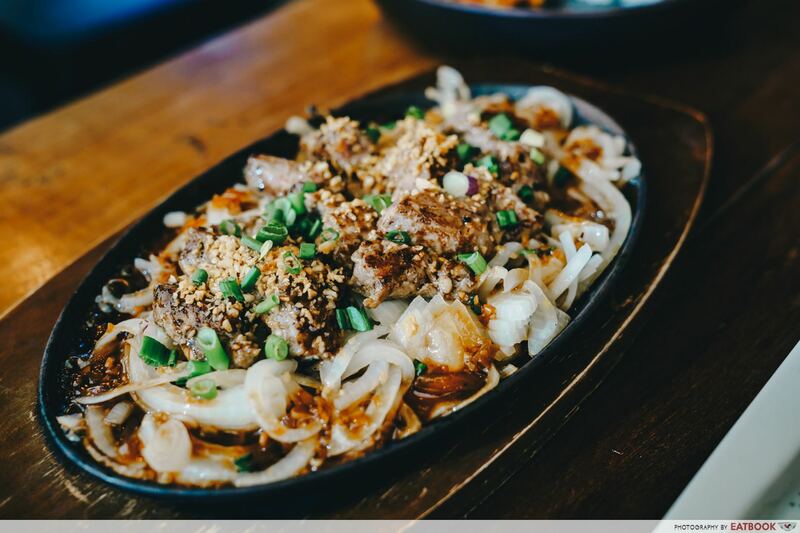 The Japanese Saikoro Steak in Sizzling Hot Plate ($34.80++) is great for sharing among the family with bite-sized sirloin beef cubes that are nicely seared to give an intense flavour. Fried with plenty of garlic and sweet ponzu soy sauce, the grade 7 Wagyu marbling also makes the beef incredibly tender, creating that melt-in-your-mouth texture. 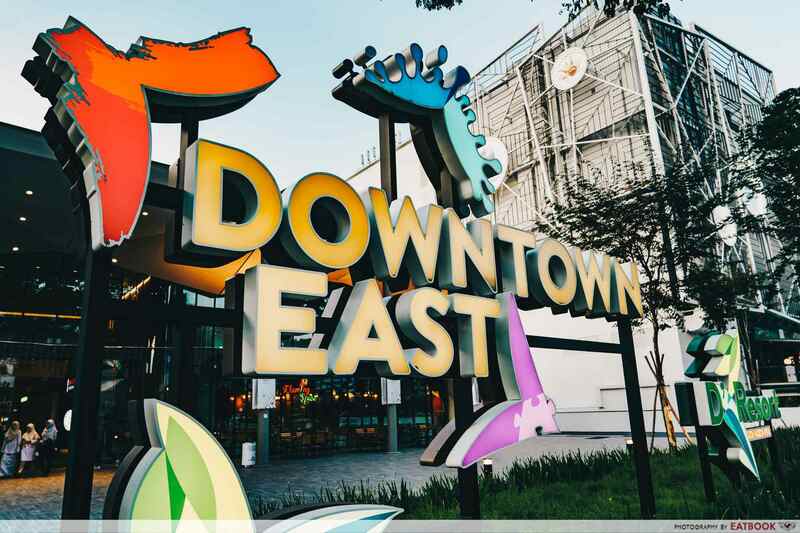 Conveniently located next to plenty of family-friendly attractions such as Wild Wild Wet and D’Resort @ Downtown East, Market Square @ Downtown East is a great place for families to unwind and spend some quality time together after a long day under the sun. 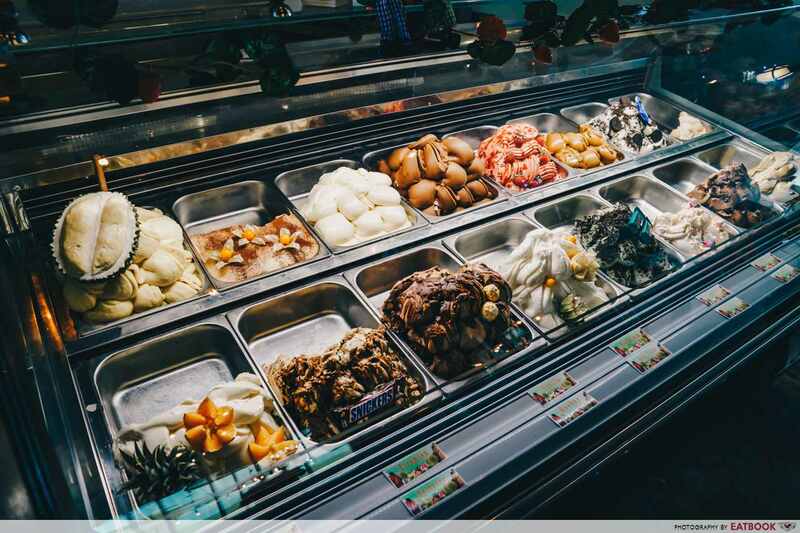 From scrumptious hotpot spreads at MANLE to housemade ice-cream at Ice Edge Café, there’s something for everyone, including the picky eaters in the family. There’s also free Wi-Fi around the mall, just make sure to manage the screen time for the kids! Downtown East is celebrating their 30th anniversary this year so be sure to follow them on Facebook and Instagram. This post is brought to you by Downtown East.